I went to see Juliet Stallwood, the cake decorator, last week and she gave me some quinces from her garden. Juliet lives in Wiltshire, fairly near to where I grew up in Dorset. It was a beautifully sunny autumnal afternoon and, as I picked up the quinces from her garden, I was flooded with memories of my childhood. We had a quince tree in our garden and my mother used to make Quince Jelly with the fruit. She has a huge pan that she would cook them in, and then she would tie the mixture in muslin and leave to drip into a large, ornate bowl, hanging from a bar on the side of the sink in our bathroom. (It would splash onto the paintwork making an almost-impossible cleaning job!) I took the quinces home from Juliet’s and phoned my mother to get the recipe. 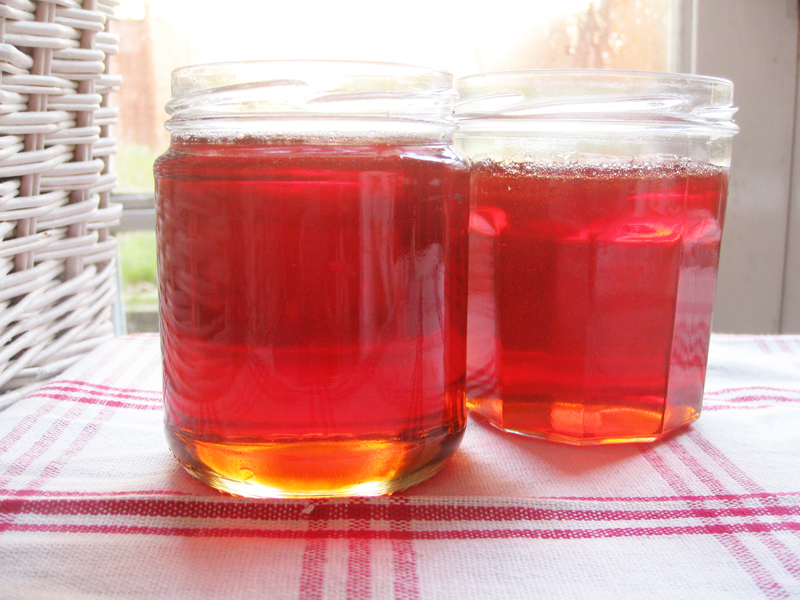 She found hers, read it out to me and then peppered it with “Oh no, I never bothered with that” and “I don’t remember doing that – I just used a potato masher.” So the recipe below is the results of many years of delicious quince jelly-making from my mother. It’s wonderful to revisit heritage recipes, especially with heritage ingredients. Quinces are an unusual fruit, but much loved by those in the know, and becoming more widely available. They’re shaped like a bulging pear, and ripen to a golden yellow colour. And they smell amazing – with wafts of citrus amongst the sweet aromas. They date back to Ancient Greek times where, associated with Aphrodite, they were part of the wedding ceremonies. And their symbolism has carried through – the tree is still seen as a symbol of fertility and love in Croatia and Slavonia, for example, where a quince tree is planted when a baby is born. Quinces grow throughout the world and feature in Middle Eastern tagines, for example, (Turkey produces a quarter of the world production, apparently) as well as recipes throughout Europe, America and Australia. You can bake them and stew them, use them in crumbles and puddings, use them to make a paste to go with meat or cheese, make dessert wine or brandy with them, as well making the better-known marmalades, jams and jellies (they’re high in pectin). I used a muslin from the days of Zoe as a baby – so this has been an experience full of gorgeous memories! Wash the quinces and chop into pieces, but don’t peel or core them. Put into a very large, heavy-based saucepan (or two large ones if you don’t have a very large one) and cover with 3.5/122fl oz cold water. Cover with a lid and bring to the boil over a high heat, then turn the heat down to low and leave to simmer for an hour, until the fruit is tender. Measure the liquid and weigh out 500g/1lb 2oz for each 600ml/20fl oz of liquid. (I used 2kg/4lb 8oz as I had 2.4l/84fl oz of liquid.) Bring the liquid to boil in a clean, very large, heavy-based saucepan over a high heat. Add the sugar and bring to the boil again, stirring the sugar so that it doesn’t stick to the bottom of the pan. Leave to simmer over a medium heat until bubbling and it has reached setting point. (To test, spoon a small amount onto a cold saucer and if it starts to wrinkle when you put your finger on it, it’s ready.) Remove any scum from the surface and discard. Pour the liquid into sterilized jars and leave to set. I’ve been asked by Kallo to be their soya expert for their new range of Organic Soya Drinks. It is incredibly exciting to collaborate with them because they are such a wonderful firm to work with, and the soya milks are great! There are five – Original (sweetened) chilled, Original ambient, Unsweetened chilled, Unsweetened ambient, and Chocolate. Kallo is a natural and organic food company that is a real pioneer in the organic food arena. It has redeveloped and rebranded its soya milks with delicious organic soya beans sourced from Italy. The milks include calcium, are low in saturated fat of course, and the sweetened ones use raw cane sugar, so they’re a nutritious and healthy alternative to dairy. What’s more, Kallo focuses on mindful eating – giving more thought to what you eat – that has been hailed as a new and exciting way to eat, enjoy food, lose weight and stay healthy. 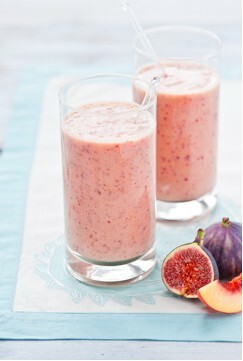 Peach & Fig Smoothie – with nutrient-dense figs and peaches, and Manuka honey, as well. 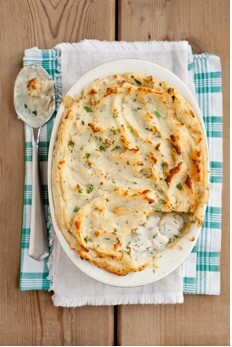 Fish Pie – a dairy-free version of the much-loved classic, in this recipe you poach the fish in soya milk, use it to make a Bechamel sauce and then add it to the mashed potato, too. 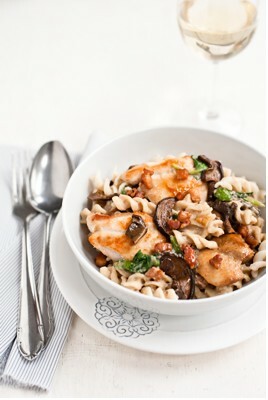 Chicken, Porcini & Pancetta Pasta – here are rich, earthy flavours and a deliciously creamy white sauce. 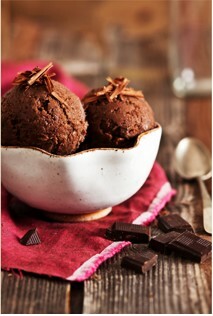 Chocolate Ice Cream – you don’t need an ice-cream maker to whip up this dish – you can simply use an electric whisk and your freezer and then sit back and indulge! 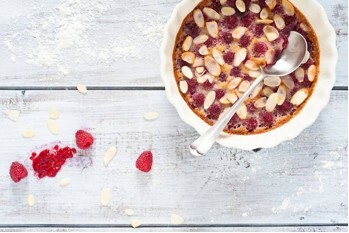 Raspberry & Almond Clafoutis – raspberry and almond are a classic combination – and this clafoutis showcases the summery flavours beautifully. 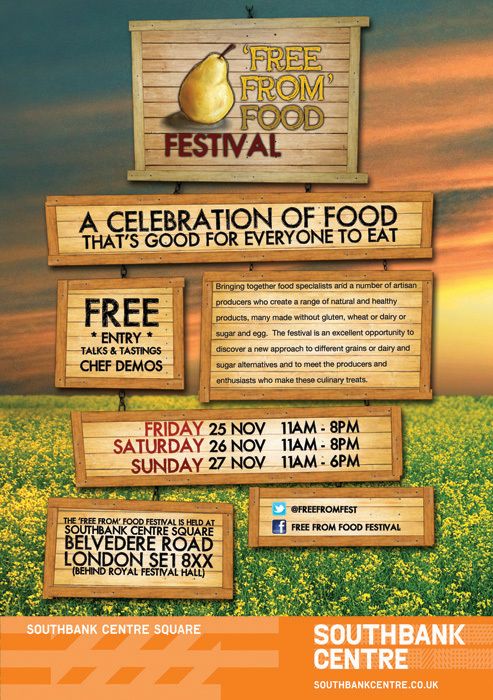 I’m hugely excited about the newly-launched Free-From Food Festival next weekend. I’m going to do a demo on Saturday 26 November 1.30–2.15pm – and I’m going to make the Raspberry & Rosewater Cupcakes that feature on the cover of my new book Simply Gluten-Free & Dairy-Free. Caroline Aherne, the owner of Sugargrain, which makes award-winning free-from baked goods, has set up the Festival. Bringing together food specialists and artisan producers, the Festival showcases natural and healthy products that are free-from, especially ones without gluten, wheat, dairy, sugar or egg. I’m looking forward to meeting different producers and experts – and trying new products. I’d love to show you how to whip up gluten-free and dairy-free cupcakes that are light, moist and incredibly delicious. So if you can make it, it would be great to see you! I’ve been doing a lot of experimenting with bread recently. 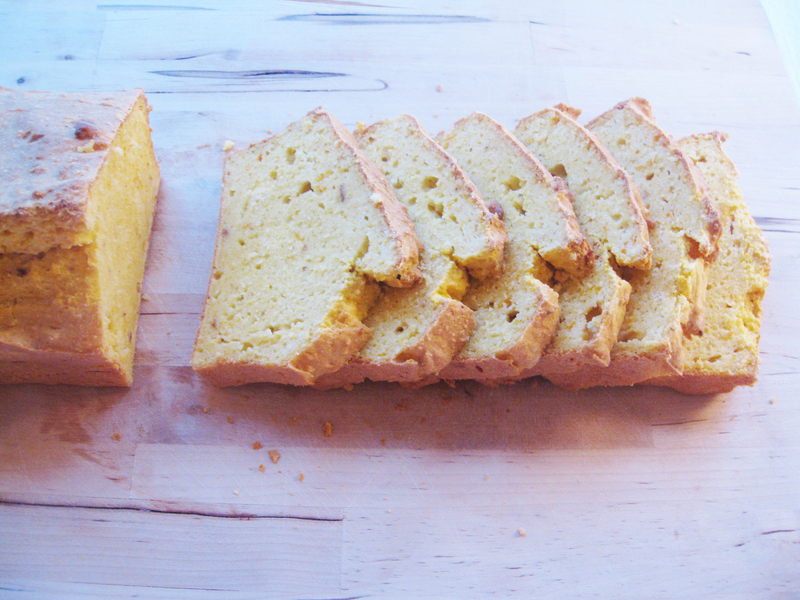 And one of the loaves I’ve made is this Pumpkin Cornbread. This is a deliciously light, moist bread – with the sweet tastes of the pumpkin and maize flour. It doesn’t rise much – but it’s still light in texture. And one of the great things about this bread, apart from the delicious taste, is that it’s yeast-free. So if you’re intolerant to yeast, as well as gluten and dairy, you can still have bread. Yay! You can always make a batch and put in the freezer as this bread freezes well. Great toasted and untoasted, with sweet or savoury spreads. Preheat the oven to 180°C/350°F/Gas 4 and lightly grease a 900g/2lb loaf tin with dairy-free margarine. Put the pumpkin on a baking sheet and bake for 30 minutes until tender. Put into a blender or food processor, add a little of the soya milk and blend until smooth. Add the eggs and blend until thoroughly mixed. Sift the flours into a large mixing bowl and stir in the baking powder, xanthan gum and salt. Using cold fingertips, rub the dairy-free margarine into the flour until the mixture resembles breadcrumbs. Make a well in the centre and pour in the pumpkin mixture. Gradually draw the flour into the liquid using a wooden spoon, mixing well to form a smooth batter. Spoon the dough into the tin and smooth the surface with the back of a metal spoon. 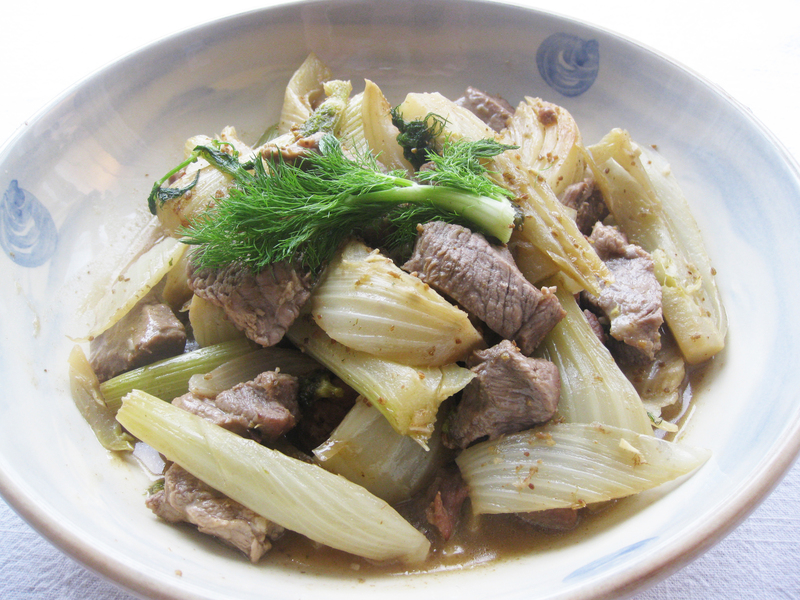 The earthy aniseed taste of fennel goes wonderfully well with pork – and here I’ve used both fresh fennel and fennel seeds, too, to deepen the flavours. Fennel is a brilliant vegetable for people with allergies/intolerances/coeliac disease who experience bowel problem because it is rich in phytochemicals, including quercetin which helps inflammatory conditions and high in the compound anethole which acts as an anti-spasmodic, helping to relieve or prevent irritable bowel spasms, as well as being packed with antioxidants to help boost your immune system generally. Heat a heavy-based frying pan over a medium heat and add the sesame seeds. Dry-fry for 2–3 minutes, stirring continuously, until fragrant. Remove from the heat and grind to a fine powder with a mini food processor or spice mill. Trim the leafy fronds off the fennel and leave to one side. Slice each bulb in half lengthways and then slice each half into quarters. Heat the olive oil in a large, heavy-based frying pan over a medium-high heat. Add the pork and cook for 2–3 minutes until the meat browns. Remove from the pan with a slotted spoon and leave to one side. Put the fennel in the pan and cover the pan with a lid and cook, shaking the pan occasionally, for 5–6 minutes until the fennel is starting to brown. Stir in the garlic and cook for 30 seconds, then add the ground fennel seeds and season lightly with salt and pepper. Return the pork to the pan and pour in the stock. Stir well and and cook, covered, for a 8–10 minutes until the fennel is tender and the pork is cooked through. Serve hot.